Investing in a residential property means taking all of your valuable time and money and turning it into something to be proud of calling your own, something that will last rather than that which quickly fades and loses its appeal. As a homeowner, it’s important to remember that a thorough and professional paint job not only brings out the lovely character of your home but also serves as a barrier against the elements of Mother Nature. At Liberty USA Painting, we dedicate our efforts to enhancing your home’s exterior appearance so that it will stand out in beauty and charm for years to come! Our professional painters get the job done right the first time, every time. From the preparation process to our thorough on site clean-up, your home will be given the respect it deserves. We have a highly qualified team of skilled professionals that stand ready to diagnose and solve the unique challenges of each and every project we take on. And, with so much diversity in the many DFW homes that we serve, that ability to face unique structural and material challenges is a crucial aspect of choosing the right painting company. Not every company cares for the details in the way in which we do, and not every company coats every surface with the most innovative and colorful solutions like we do. Power Washing – We start by cleaning and preparing the surface to be painted by removing dirt, mold, mildew, pollutants, pollen and dust. Power washing also removes most chalking. Chalking is a naturally occurring breakdown of the paints skin surface from the sun’s ultraviolet rays. Minor Wood Repair – Most exterior jobs that we do require minor wood repair or replacement, so we perform those tasks as needed. All loose boards will be nailed down, and rotten wood will be replaced. Spot Priming – We spot prime all carpentry work and appropriate surfaces. Caulking – We recognize that gaps and cracks are your home’s worst enemy. Not only do they reduce energy efficiency by creating drafts, but they allow pests and moisture to have easy access into your home. We caulk all seams, joints, cracks and nail holes with a 45 years rated poly seam caulk. Finish Coat – Once we complete the power washing, carpentry work, spot priming and caulking, we will begin with the painting process. We use only superior paint products supplied by local Sherwin Williams stores. Clean Up – Your home and property will be thoroughly cleaned up after our work is complete, and all debris will be disposed of in the proper manner. Our thorough exterior painting process considers all of the angles of your home, protecting its outward appearance and its durability in the face of the many elements of nature. 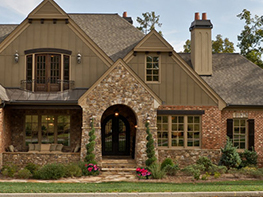 The high quality paint that we use through Sherwin Williams allows us to provide your home with a vast amount of color options, offering a superior outer covering for your residential property that stands out in quality and in style. Call us today to learn more about Liberty USA Painting and how to get started with your exterior painting project!